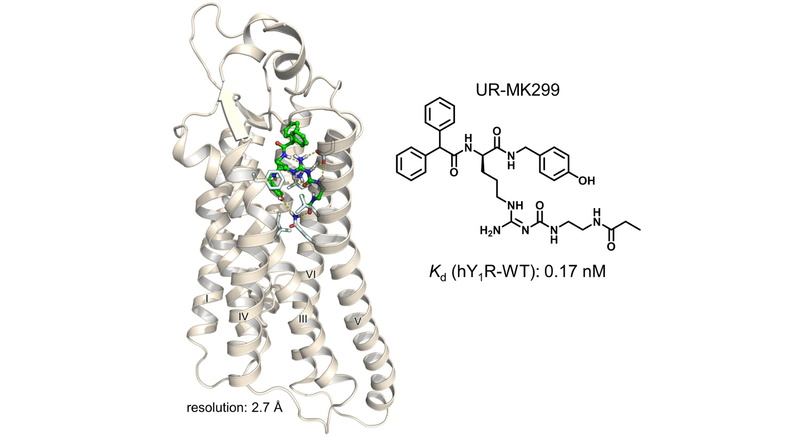 GRK 1910 is a joint Research Training Group funded by the Deutsche For-schungsgemeinschaft (DFG) focussing on the medicinal chemistry of selective GPCR ligands. The Research Training Group is located at the Friedrich-Alexander University Erlangen-Nürnberg and the University Regensburg. The program started on 1st October 2013. More information about GRK 1910. “Autodisplay - Bacterial Display of Recombinant Proteins for Applications in Drug Discovery and Biocatalysis"
Seminar "Goodbye Academia? - Berufswege nach der Promotion"
The biannual Summer School in Medicinal Chemistry will be held from September 19th - September 21st, 2018 at the University of Regensburg. It is co-organized by our research training group GRK1910 and is dedicated in memoriam Prof. Armin Buschauer who passed away too early last year. On Wednesday, September 19th, the summer school will start in the late afternoon with a memorial lecture in his honor followed by a get-together. On Thursday and Friday (Sept 20th to 21st) the summer school will present a blend of interesting topics from medicinal chemistry including a poster session and a session with short oral presentations selected from the abstracts. There is no registration fee but registration is mandatory for logistic reasons. Please save the date and register early as it will make the organization a lot easier. At very summery temperatures above 30°C this year's retreat of the Research Training Group took place on July 26th-27th. Framed by two great talks given by Prof. Rainer Böckmann and Prof. Christoph Klein the RTG members reported on their current projects, which formed the starting point for many fruitful and lively discussions. “The Heidelberg Series of Glu-ureido based PSMA tracers: Adaption of chemical structure to clinical indication"
“Fluorine in Peptide and Protein Engineering"
We are proud to announce that the GRK1910 members Max Keller, David Wifling, Nicole Plank, Timo Littmann and Armin Buschauer (posthum) very recently published their GRK funded work in Nature. The publication is a result of an international cooperation with scientists in Shanghai, Beijing, Nashville, and Leipzig. Structural basis of ligand binding modes at the neuropeptide Y Y1 receptor, Nature 556, 520–524 (2018). In humans, the family of neuropeptide Y (NPY) receptors comprises four functional subtypes, namely the Y1, Y2, Y4 and Y5 receptor, all belonging to the superfamily of G-protein coupled receptors. NPY receptors are involved in numerous physiological processes such as regulation of hormone release, blood pressure and food intake. Yang et al. resolved two crystal structures of the Y1 receptor in complex with the antagonists UR-MK299 and BMS-193885, respectively. These structures provide an invaluable basis for the development of highly potent and subtype-selective NPY receptor ligands, e.g. for molecular imaging. Left: Human NPY Y1 receptor co-crystallized with the arginine-type antagonist UR-MK299 (shown in green). Right: Structure of and dissociation constant Kd UR-MK299. The Research Training Group “Medicinal Chemistry of Selective GPCR Ligands” offers 1 PostDoc position (TV‐L E13, 100%) associated to the Faculty for Chemistry and Pharmacy, University of Regensburg. The current position refers to Project P3: Orphan GPCRs as potential drug targets. The GRK1910 is pleased to report that the DFG has granted a second 4.5 year period of funding our research training group reaching until September 2022. "Fluorescence anisotropy based assay for monitoring of ligand binding to GPCR. Challenges and possibilities"
"Discovery of highly selective protein kinase inhibitors with the furo[3,2-b]pyridine core"
"Carbocyclic C-nucleosides: synthesis and potential use in modern biology"
Prof. Peter Hildebrand (Institut für Medizinische Physik und Biophysik Universität Leipzig) will give a talk entitled "Role of GPCR dynamics in signalling". Kilian Kuhn and Thomas Ertl present the results of their recent publication on the development of high affinity Y4 agonists. Prof. Nick Holliday (University of Nottingham) will give a talk entitled "Glowing pharmacology: insights from imaging GPCR ligand binding and dimerisation". Subsequently, Prof. Carsten Hoffmann (Rudolf‐Virchow‐Zentrum, Würzburg) will talk about "G‐protein‐coupled receptor signaling in real time revealed by the use of optical probes". Prof. Kjell Fuxe (Karolinska Institutet, Stockholm) will visit Erlangen on January 16th and 17th. His postdoc Dr. Dasiel Borroto-Escuela will give a talk entitled "On the existence of multiple A2A, D2R and Sigma1R allosteric receptor receptor interactions in Sigma1-D2R and A2A-D2R-Sigma1R heteroreceptor complexes: role in brain plasticity and cocaine". The 8th International Summer School “Medicinal Chemistry”, organized by the DFG Research Training Group GRK1910 “Medicinal Chemistry of Selective GPCR Ligands”, took place at the University of Regensburg, September 21 – 23, 2016. Sixteen distinguished scientists from academia and industry accepted the invitation to contribute to a program combining teaching and cutting-edge research. Prof. Dr. Nigel Bunnett (Colombia University, NY) will give a talk entitled "G Protein-coupled receptors: Dynamic machines for signaling pain, itch and neurogenic inflammation". This year the retreat will be devided into two parts. 8th Summer School "Medicinal Chemistry"
The 8th Summer School "Medicinal Chemistry" organized and presented of the GRK1910 will take place in Regensburg on 21st-23rd September 2016. The Research Day of the Emil Fischer Graduate Programme will take place on July 7th 2016. Prof. Dr. Kevin Burgess (Texas A & M University) will give a talk entitled "Using EKO to sample conformational sweet-spots in peptidomimetic design". On June 7/8, 2016, Kevin Burgess from the Texas A&M University will give a workshop for GRK1910 members. The workshop will start on June 7th at 2 pm and will end on June 8th at 1 pm on the campus of the University of Regensburg, Biology building, room DE 2.121. Dr. Irene Coin (University Leipzig) will give a talk entitled "Genetically incorporated chemical probes for GPCR studies". Prof. Dr. Bernhard Wünsch (Universität Münster) will give a talk at the FAU entitled "GluN2B selective NMDA receptor antagonists". The 3rd conference on impedance-based cellular assays will be hosted by the Universitaet Regensburg from August 9th till 12th. More details on program and registration can be found on the conference website (http://www.ibca2016.net). As an initiative of the COST-funded GLISTEN network in collaboration with the GRK 1910 research group an outstanding group of GPCR experts from the research community and industry met in Erlangen to discuss the latest and hottest topics regarding ligand-receptor interactions, crystal structures and transmembrane signalling. Over 170 participants had to chance to attend the talks of highly prominent speakers including Nobel laureate Brian Kobilka. Additionally, 75 posters were presented during two sessions. Prof. Dr. Takeaki Ozawa (University of Tokyo) will give a talk entitled "Luminescent sensors and optical switches for single cell analysis". The 8th Summer School "Medicinal Chemistry" organized and presented of the GRK1910 will take place in Regensburg on 21-23th September 2016. GRK Seminar "Good Scientific Practice"
A group of RTG fellows visited the high throughput screening facilities of Amgen Research GmbH in Regensburg. According to official numbers the HTS lab screeens more than 15 million compounds per year for a variety of different targets. After an introductory talk describing Amgen's screening approaches and strategies, a tour through the HTS labs provided a vivid impression about lab automation and standardization. The day was completed by a mini-workshop on label-free approaches to monitor cell-based assays with special emphasis on GPCR as targets. Prof. Dr. Clemencia Pinilla (Torrey Pines Institute for Molecular Studies, San Diego) will give a talk entitled "Positional Scanning Libraries: Concepts, Identification of GPCR ligands and Elucidation of T cell specificity". On Monday, November 9, GRK members will visit the High Throuput Screening facilities of Amgen (https://www.amgen.de/) in Regensburg in the morning, followed by a mini-workshop on label-free technologies in the afternoon. On Tuesday, November 10, Dr. Clemencia Pinilla from the Torrey Pines Institute for Molecular Studies (http://www.tpims.org/our-scientists/california-team/clemencia-pinilla) will give a workshop on the use of synthetic combinatorial compound libraries for the de-novo identification of bioactive compounds, in Erlangen. At very summery temperatures above 30°C the second retreat of the Research Training Group took place on 22st-23nd July. After two great talks by Prof. Uwe Sonnewald and Prof. Torsten Kuwert the RTG members reported on their current projects, which formed the starting point for many fruitful and lively discussions. To see some impressions of the retreat, please click on the picture below. The Research Day of the Emil Fischer Graduate Programme will take place on July 9th 2015. Prof. Dr. Mette Rosenkilde (University of Copenhagen) will give a talk entitled "Constitutive and biased signalling of chemokine receptors". Prof. Dr. Léon Ghosez (Institut Européen de Chimie et Biologie Bordeaux/Pessac – France) will give a talk entitled "Design and synthesis of natural-inspired scaffolds as an invaluable source of molecules of therapeutic interest". 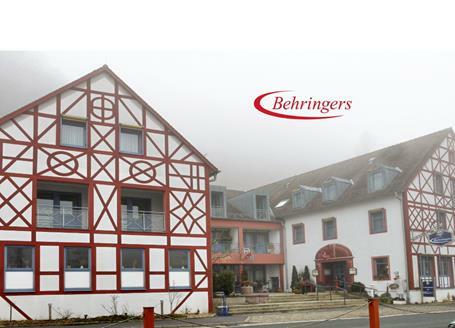 We are happy to announce that the date and venue of the Retreat 2015 can now be confirmed. 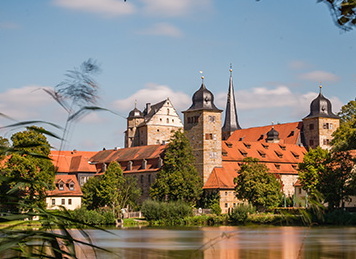 The event will take place on July 22nd-23rd at Schloss Thurnau west of Bayreuth. Dr. Tobias Langenhan (University Würzburg) will give a talk entitled "Adhesion-GPCRs - a novel class of metabotropic mechanoreceptors?". Prof. Dr. Jens Carlsson (Stockholm University) will give a talk entitled "Successes and failures in structure-based discovery of GPCR ligands: Two steps forward, one step back". Prof. Dr. Masha Niv (The Hebrew University of Jerusalem) will give a talk entitled "Bitter compounds and their receptors: selectivity, promiscuity and open questions". Dr. Peter Kolb (Philipps-Universität Marburg) will give a talk titled "Interactions between GPCRs and ligands: Screening, selectivity and mechanism". Prof. Dr. Felix Engel (Universitätsklinikum Erlangen) will give a talk titled "Adhesion GPCRs". Prof. Dr. Oliver Zerbe (University Zürich) will give a talk titled "Towards structures of G-protein coupled receptors by solution NMR". Prof. Dr. Heinz H. Pertz (FU Berlin) will give a talk titled "Serotonin - Native Receptor Subtypes and their Role in the Cardiovascular System". The 7th Summer School “Medicinal Chemistry” took place from 17th-19th Sep in Regensburg. Speakers from all around the world were invited to present their latest findings in drug research, GPCR structure and function as well as anti-infectives. PhD students presented their projects by posters or short oral presentations. The dinner in the evening provided an excellent framework for fruitful scientific and non scientific discussions. To see some impressions of the event, please click on the picture below. Dr. Mélanie Hall (Department of Chemistry, University of Graz, Austria) will give a talk on the "Development of Biocatalytic Tools for the Synthesis of Enantiopure Molecules". The Research Training Group “Medicinal Chemistry of Selective GPCR Ligands” offers 1 Post-Doc Position (TV‐L E13, 100%) at the University of Regensburg (Germany). Retreat 2014: "What belongs together, grows together"
The first retreat of the Research Training Group took place on 21st-22nd July. After two days with great talks by Prof. Roland Seifert and Prof. Joachim Hornegger, 24 progress reports of the PhD students and postdocs, and a lot lot of fruitful communication the group really welded together. The Research Day of the Emil Fischer Graduate Programme will take place on July 10th 2014. The GRK 1910 is proud to announce the partnership with the new international graduate program "Receptor Dynamics: Emerging Paradigms for Novel Drugs". This program is a joint initiative of the Universities of Würzburg, Bayreuth, Erlangen-Nürnberg, and Regensburg and is funded by the Elite Network of Bavaria, Germany. 7th Summer School "Medicinal Chemistry"
The 7th Summer School "Medicinal Chemistry" organized and presented of the GRK1910 will take place in Regensburg on 17-19th September 2014. We are happy to announce that the date and venue of the Retreat 2014 can now be confirmed. 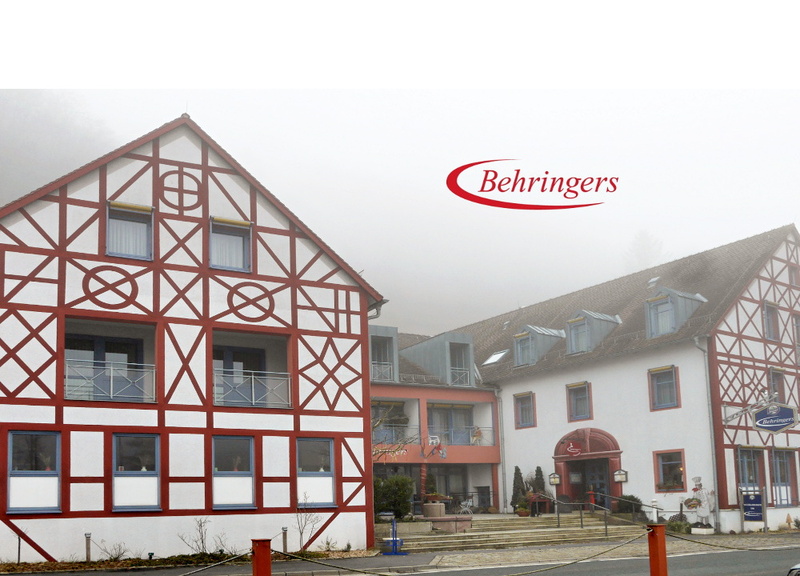 The event will take place on July 21st-22nd at the conference hotel Behringers next to Gößweinstein in the "Fränkische Schweiz". The first workshop of our Research Training Group was held in Regensburg on February 13-14th. Doctoral students, postdocs and supervisors met to get to know each other and to learn about all the starting research projects and teaching events. Additionally, Prof. Dr. Morten Grøtli (University of Gothenburg) gave a lecture about developing MEK and RET Inhibitors. Prof. Tim Clark introdoced the brand new web-based modeling server. The assembly of graduates and postdocs elected Kilian Kuhn (UR) and Thorsten Schäfer (FAU) as Student representatives.